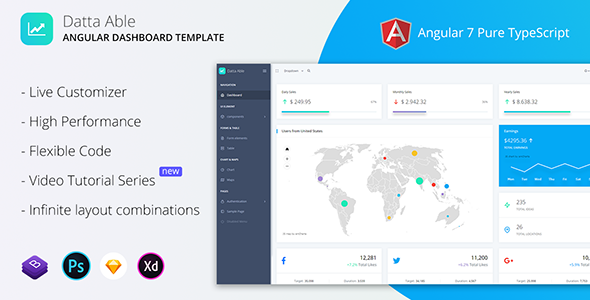 Datta Able Angular Admin Template made using Angular 7 & Bootstrap 4 framework for achieve any easy or complex dashboard need. Design by CreativeForm and develop by codedthemes’s experience team. We’ve made Datta Able dashboard template as completely flexible to use in your project. Explore Datta Able demos which fulfill your need. Here are top features comes with Datta Able admin template. Pure eye catchy and vibrant colors are used in Datta Able Dashboard Template. More than 30+ preset color combination comeup with template. You can also apply your custom color combination via single change in SCSS file with the help of Documentation OR video helper guide. We’ve choosen cool eye catchy colors for entire Datta Able Admin Template. 30+ light color combination available which makes Datta Able completely differ to other dashboard templates. Datta Able Admin Template comes with all Bootstrap basic components and we’ve also implemented extra 3’rd party tons of components which listed below. All components are in latest version too. Performance is our key point before developing Datta Able Admin Template and we’ve made it with lots of testing and efforts on code improvement. Datta Able Admin Template is made for performance and we’ve achieve it in terms of design testing or code testing. Design passed with good score in Google Page Speed, Pingdom, gtMetrix and code passed via w3 validators. Datta Able comes with variety of 3’rd party app & extensions which directly usable in your project. We’re continously working on next app & extensions for future release version update. Our newly lanched video series helps you in every steps in your development 24×7 without contacting further in our support desk. Request new feature/video tutorial – contact us. Separate support desk for quick resolution of your query. Our previous support ratio result is – 90% query resolution in 1’st response. This is Bootstrap HTML version and do not compare demos with Datta Able Angular version, React, Vue JS, etc…subsequent version.